Syrian refugees in Jordan who have received Said Foundation scholarships. Three years ago, the Institute of International Education in the United States, which administers Fulbright programs, launched the Syria Consortium for Higher Education in Crisis, a grant program to help Syrian students with urgent financial need to enroll in American degree-granting programs. The consortium collaborated with Jusoor, a Syrian nongovernmental organization, to place 500 Syrian students in American universities. But the program is meeting only a fraction of the demand. 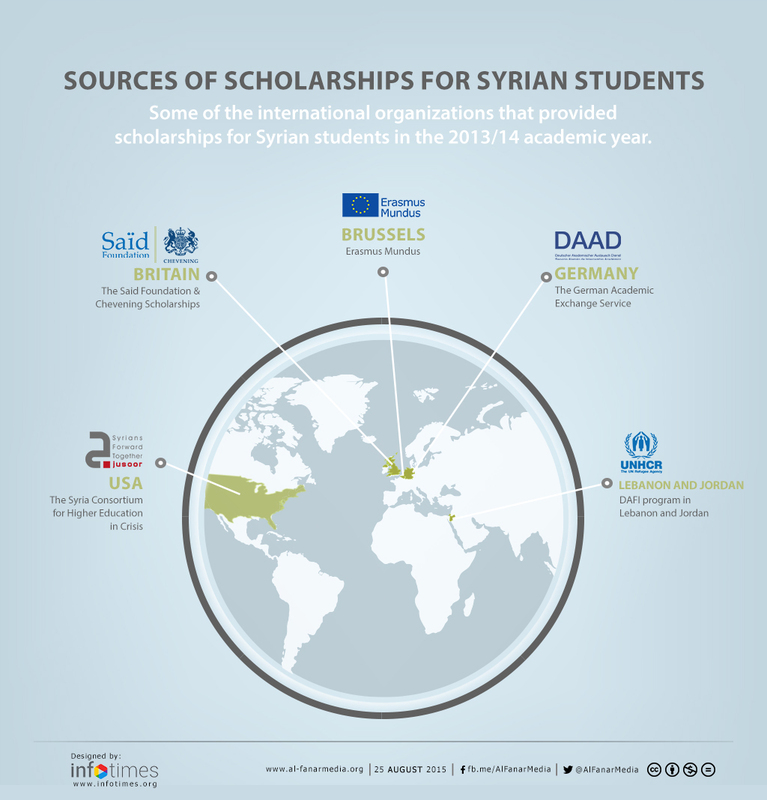 More than 4,000 Syrians applied for scholarships through the program last year. Forty-three students secured grants. “While Syrian students appear to be equally interested in U.S. and European educations, more may be going to Europe because there are several government-supported scholarship programs available,” said the Institute of International Education’s vice president of external affairs, Daniela Kaisth. But Syrian applicants to European programs don’t fare much better. Germany, the economic powerhouse of Europe, perhaps best illustrates the situation. The government-supported German Academic Exchange Service, also known as DAAD, started up a special $8.7 million program last year—Leadership for Syrian Students. With 221 fully funded scholarships, the program is among the largest assisting Syrian college students in Europe. But more than 5,000 Syrians applied for the program for the 2015-2016 academic year. Eight years ago, 26 Syrian students received scholarships through Erasmus Mundus, a European program that offers scholarships and academic programs in Europe and throughout the world. Last year, around 100 Syrian students received the program’s highly coveted aid package. Students apply to universities and then receive the aid package through different channels, making it hard to total up the number of recipients. Statistics from other sources shed light on how many people might be applying for the Erasmus Mundus program in Germany, however. German officials in Lebanon—where the German embassy closest to Syria is now located—received fewer than 100 student visa applications before the war began. Last year, the embassy received more than 1,100 applications, officials said. The same rush has occurred for German language tests, a condition to secure a seat in most German universities, with the exception of some master’s degree programs conducted in English. 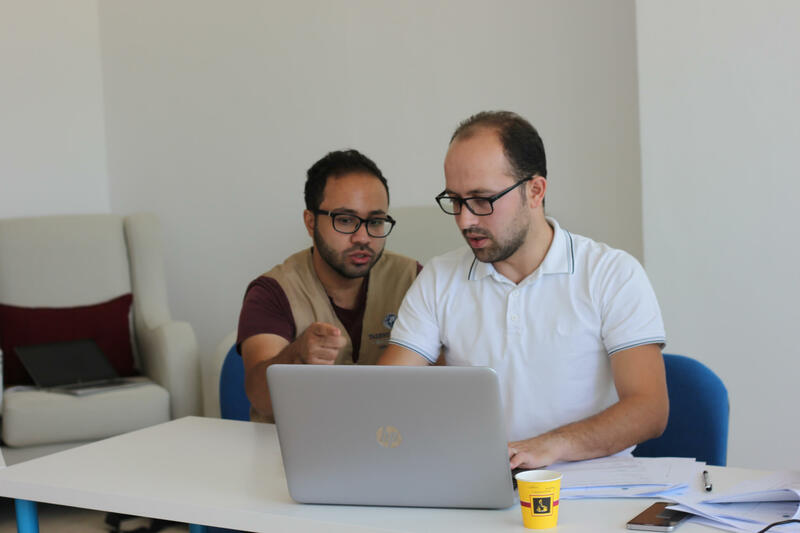 Since the Goethe Institute, a study center of German language and culture, closed in Damascus three years ago, around 1,600 Syrians have taken the test at the Institute’s Beirut branch. In the same period, fewer than 1,000 Lebanese students have taken the test. Other countries, like the United Kingdom, don’t have special programs for Syrians, but demand has rocketed up for general programs to which Syrians can apply. Syrian applicants for the highly competitive Chevening Scholarships in Britain grew from 508 in 2013 to 1,213 last year. Yet the number of scholarships awarded to Syrians has declined from 16 to 8 in the last six years, according to Britain’s Foreign Office. Some private organizations are trying to fill the gap between Arab students accepted at universities in the United Kingdom and those able to afford them. The Said Foundation offers university funding in Britain for students from Syria, Jordan, Palestine and Lebanon. But the foundation acknowledges it can’t meet all of the need. The annual number of scholarships awarded to Syrian students has increased from eight in 2010 to 15 in 2015, according to Ita Gallagher, who oversees the foundation’s educational aid programs. The number of applicants has increased from 105 to 208 over the same period. 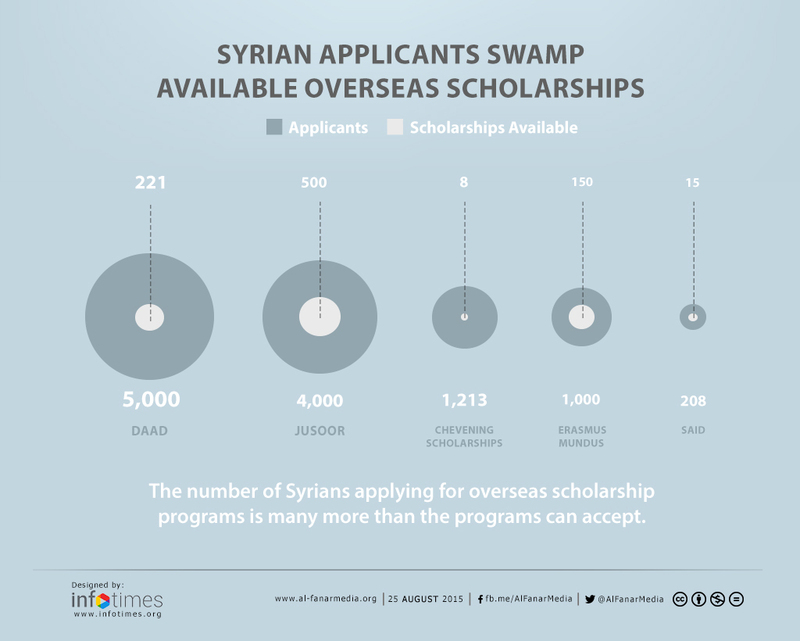 The imbalance between Syrian students applying for overseas scholarships and those who get them paints a portrait of frustration—thousands of Syrian students staying in the region, unable to get the education they desire.